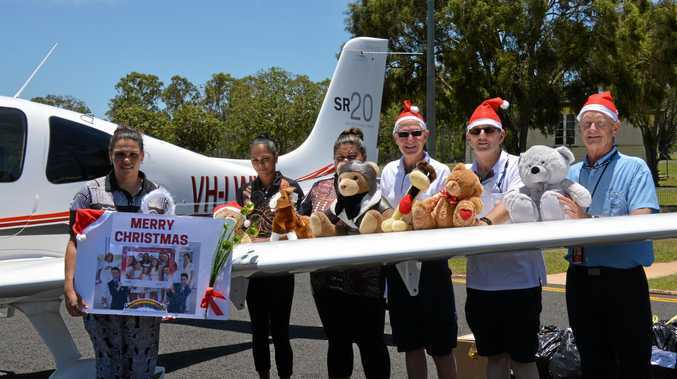 ANGEL Flight has delivered gifts for the children of Cherbourg just in time for Christmas. The charity organisation visited the South Burnett this week to drop off the toy donations. Santa will hand out the toys at the Cherbourg Community Rodeo on December 15. Beaudesert QCWA and Gold Coast-based Paradise Kids donated the toys. Three pilots flew into Kingaroy Airport loaded up with toys on Wednesday. Angel Flight is a charity that co-ordinates non-emergency flights to help country people trying to deal with bad health, poor finances and distances. It was was founded in 2003 and is funded by private donations from individuals, service clubs, companies, and diseased estates. The organisation co-ordinates about 20 flights a day. It transports medical drugs, blood, blood products and patients of all ages. All pilots are volunteers and operate Australia-wide. For more information go to www.angelflight.org.au.